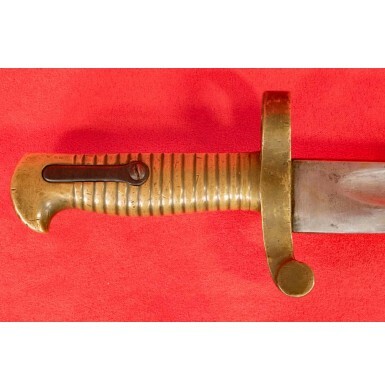 This is a scarce example of the brass handled saber bayonet for use on a P.S. Justice rifle, as produced by that company circa 1861-1862. The firm of P.S. Justice of Philadelphia had its genesis as Justice & Steinmann, a sporting goods and hardware retailer. In 1842 Justice & Steinmann became customers of the Henry family company known as Bolton Gun Works (later J. Henry & Sons) and began retailing Henry produced rifles and shotguns in two Philadelphia retail locations. It is likely that the Justice company also offered guns by other makers as well and it appears that prior to the American Civil War, Justice was not in the business of “manufacturing” firearms. The Justice firm was one of J. Henry & Sons largest clients and purchased not only completed arms, but component parts as well. The majority of these parts were likely sold to other gun makers, but Justice may have assembled some arms from these parts in the last couple of years immediately preceding the opening of hostilities between the North and the South. It is interesting to note that the Justice firm was listed as a manufacturer of “railroad car springs” in the 1860 Philadelphia Directory, and while census data from 1860 suggests that they manufactured 2,500 guns between June 1, 1859 and June 1, 1860, author & researcher George Moller notes that the company was not considered a “manufacturer” by the US Secretary of the Interior, but only as an “assembler”. In 1861 the firm officially changed their name to P.S. Justice, dropping the name of Steinmann who had died in 1845. Justice was definitely a shrewd businessman, who saw an opportunity to make money and managed to secure a number of US arms contracts in the early days of the Civil War. Within days of war being declared, Justice contacted his largest supplier, J. Henry & Sons, in an attempt to purchase as many arms as possible for resale to the US government and various state and local militias. He also undertook a campaign of letter writing to state and federal officials, offering to manufacture various patterns of long arms for use by the troops that were volunteering to put down the “rebellion”. In these letters he made some outrageous claims as to his manufacturing capability, suggesting that he could produce “…1,000 stands per week and increase it to double if it is possible before the autumn closes”, as well as claiming to be making “…extensive arrangements to manufacture the ‘Enfield’ pattern Rifle both short and long pattern”. 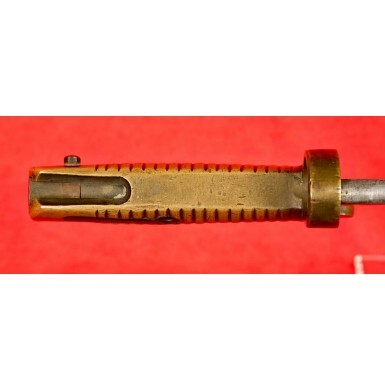 Justice further claimed that that he was “…now engaged in making [a] superior Army Rifle, with either the ordinary [socket] or the sabre bayonet…”. Justice never did “arrange to manufacture” Enfield pattern arms but did manage to import some 3,000 “long” (Pattern 1853) and 1,000 “short” (Pattern 1856/58/60) Enfields, which he subsequently sold to the US government. 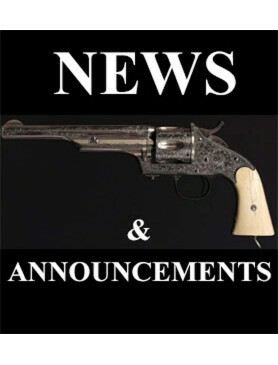 He also approached the Frankford Arsenal, offering in August of 1861 to deliver some 4,000 .69 rifled muskets “…similar in style to the sample deposited with you at $20.00 each.” The US Ordnance Department agreed that the acquisition of such arms would be in their best interests, and they agreed to contract with Justice for the production of 4,000 .69 rifled muskets at the proposed price of $20.00 each. These rifle muskets were produced in several variants, both brass and iron mounted and with barrels retained by wedges or bands. Justice also produced some 2,469 shorter barreled .58 caliber rifles, in three variations. The first being iron mounted (Type I), the second being brass mounted with a wedge retained barrel (Type II) and the last being brass mounted with barrel bands (Type III). 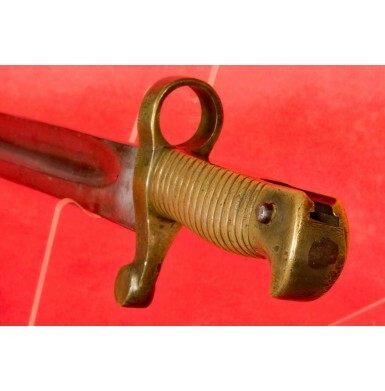 All three were equipped with an US M1855 rifle pattern bayonet lug to accept a US M1855 style brass handled saber bayonet. 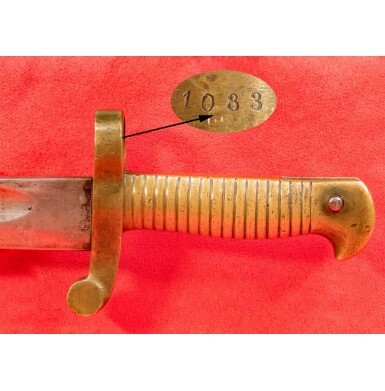 Like the Justice rifles and rifle muskets, these bayonets were serial numbered to match the guns they were fit to, with the number usually preceded by a “P” pre-fix. Offered here is one of those scarce PS Justice Rifle Saber Bayonets. 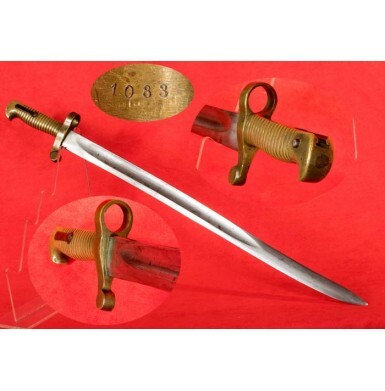 The bayonet is serial numbered 1083 on the reverse of the muzzle ring, without the “P” prefix. 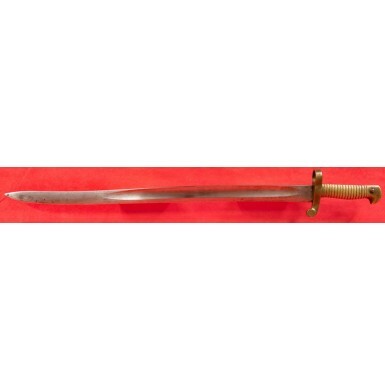 Assuming the guns and bayonets were numbered in chronological order, this bayonet was produced in about the middle of the Justice rifle production run. 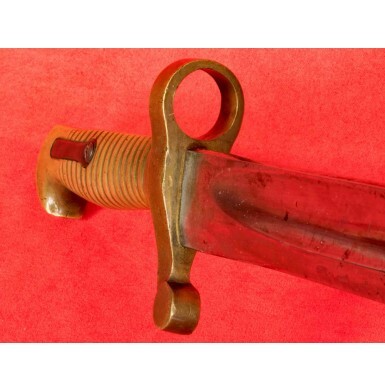 According to bayonet guru, author, researcher and collector Paul Johnson, this is a “Type III” bayonet for the Type III rifle. The lack of the “P” may indicate it was intended to fill part of the order that went to J Henry & Son. The reverse ricasso is unmarked, another indication that this may have been for one of those sub-contracted rifles. No other markings are present. 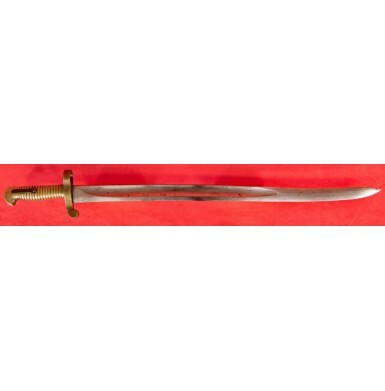 The bayonet measures 26 3/8” in overall length with a 21 ¾” long semi-yataghan blade and a 4 5/8” long brass hilt. The blade has a 13 5/8” long fuller. The hilt has a 3 3/8” long guard with a .881” diameter muzzle ring and a bottom quillon that terminates in a forward-swept flat disc. The hilt is mortised for a stud that is roughly .44” wide with a .22” wide channel and a length of 1.4”. The bayonet is in about VERY GOOD+ condition, with the blade have a dull pewter patina with scattered areas of light to moderate surface discoloration, light surface oxidation and some lightly scattered pinpricking. The very tip of the blade is very slightly bent, and a small number of tiny polishing and light sharpening marks are present along the edge of the blade. The hilt has a dull golden patina and does not appear to have been cleaned recently. The blued steel latch spring is in place in the hilt and still operates correctly. Overall this is a very nice example of a fairly rare saber bayonet for use on the equally uncommon PS Justice Rifle. While the quality of some of Justice’s arms was certainly suspect and over time his name has been associated with war profiteering by selling low quality arms to the government, I think his reputation has likely been somewhat unfairly sullied. In fact, he was one of the first contractors to make arms deliveries during the early days of the American Civil War and considering that arms production was a relatively new endeavor for the firm, they did a reasonable job of providing arms at a critical juncture in American history. This bayonet will be a fine addition to the display of your Justice rifle. Please note that these bayonets were hand fit to the individual guns they were numbered to and often do not interchange without additional fitting.